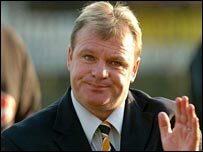 Conference club Crawley Town have appointed former Boston United boss Steve Evans as their new manager. The 44-year-old resigned from his job with the Pilgrims, where he was in his second spell as boss, on 27 May. He will be joined at the Broadfield Stadium by Paul Raynor who was his assistant at Boston. Evans led Boston to promotion to the Football League in April 2002 but left the club after an FA investigation, rejoining the club in March 2004. "There is only one manager that will start the Conference next season that has ever won it," he said after taking the reins at Crawley. "I had a number of Conference clubs speaking to me over the last seven or eight months, but no other struck me with any real imagination to get in the League. "We will have a touch of realism about it, but no-one fancied Morecambe to go up, and look what they have achieved."